The Whiteface highway on Tuesday afternoon. Photo by Phil Brown. 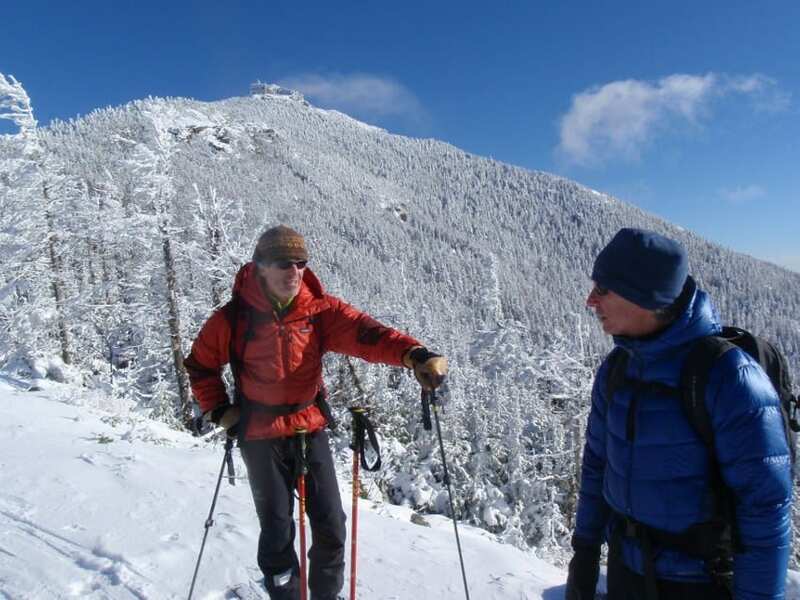 The Whiteface Mountain highway is the traditional early-season tour for Adirondack skiers. People have been hitting the road for a few weeks, but I didn’t get around to it until Tuesday. It was a beautiful sunny day, but a bit warm for skiing. The combination of a strong wind and sun created thin conditions in places. Nonetheless, most of the road was skiable both going up and coming down. I saw about a dozen other skiers—a fair number for a weekday and a testament to the popularity of this ski tour. The Whiteface Mountain highway climbs for about 5.5 miles from the tollhouse, where skiers park, to a stone building known as the Castle. In summer, the Castle features a café. In winter, the building is closed and encrusted in rime ice. 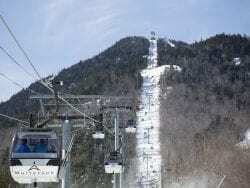 On Tuesday, I skied up only as far as the Lake Placid Turn, the first of two hairpin curves. Reached about four miles from the tollhouse, the turn offers a great view of Whiteface’s snowy summit, numerous other High Peaks, and Lake Placid. It’s a good destination if you don’t have time to go all the way to the end of the highway. The cover on the highway was thin but adequate at the start. Partway up I encountered bare spots where the wind and sun had done their mischief. 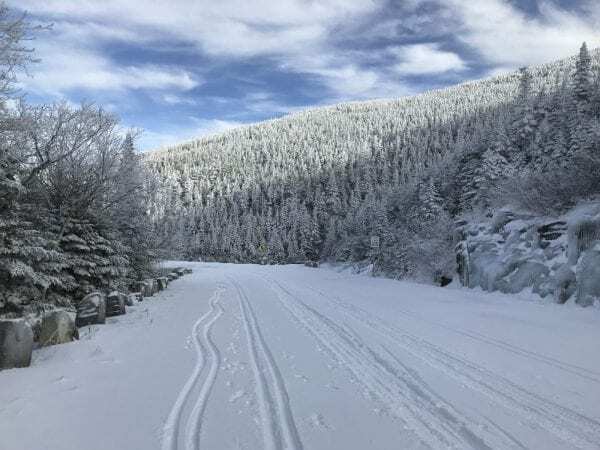 I was able to avoid them on the ascent, but by the time I returned, conditions had deteriorated to the point where I had to take off my skis and walk a quarter-mile. Oddly, I encountered a fierce wind at lower elevations, almost no wind at the Lake Placid Turn, and then a strong wind again on the return. The skiing on the descent was mellow, which isn’t a bad thing on your first ski of the season. Be aware, however, that conditions can change. On exposed bends in the road, it can be icy. 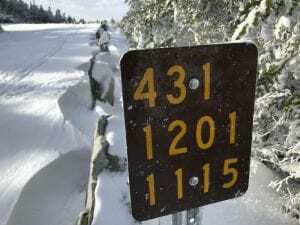 If you ski the Whiteface Mountain highway, you can monitor your uphill progress by observing the mileage signs on the right shoulder. The numbers on the signs are identical except for the last two digits in the bottom row. These indicate the distance from the Castle, which is considered the start of the road. The two digits at the tollhouse marker are 53—indicating it is 5.3 miles from the Castle. 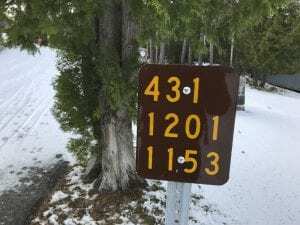 The digits at the marker just before the Lake Placid Turn are 15—or 1.5 miles from the Castle. The turn is about a tenth of a mile beyond this marker. The photos below show the first and last markers on the ascent to the hairpin. In between you’ll see similar markers every two-tenths of a mile. Click here for a fuller explanation of the numbers on mileage markers. Incidentally, there is no fee to ski the Whiteface Mountain highway. Mileage marker at the bottom of the toll road. Mileage marker just before Lake Placid Turn.